Platejoy is a service we have been using intermittently for a few months now and it is something we have really grown to love. In short, what Platejoy.com offers is meal planning services, but that is really just a small fraction of the value they deliver. Platejoy allows you to be very hands on in selecting what you eat for every single meal, or you can just set it and forget it and Platejoy will make all of the decisions for you. We have a review video we made which walks you through the process from first signing up and answering the questionnaire, all the way through cooking and eating a meal! There are a number of things that we immediately fell in love with when we tried platejoy. We’ll get to what we didn’t like further on in the post. Pretty awesome right? I would definitely like to see a “Under 20g of carbs per day” option, but these are solid choices and can even be slightly modified if you want to go lower carb. The meal plan you’re given is highly customizable. In fact, it is as customizable as you want to make it. You can let platejoy make all of the decisions for you and eat whatever is next in your queue. You also have the ability to dig through all their recipes and find the ones you really want to try. We like choosing the recipes ourselves and sometimes just scrolling through their recipes for inspiration. Platejoy has a lot of interesting and inspiring recipes. Not only can you decide which meals to make, but you can also tell Platejoy what you want it to plan for you. Each meal plan you make starts by asking you what meals you want planned. 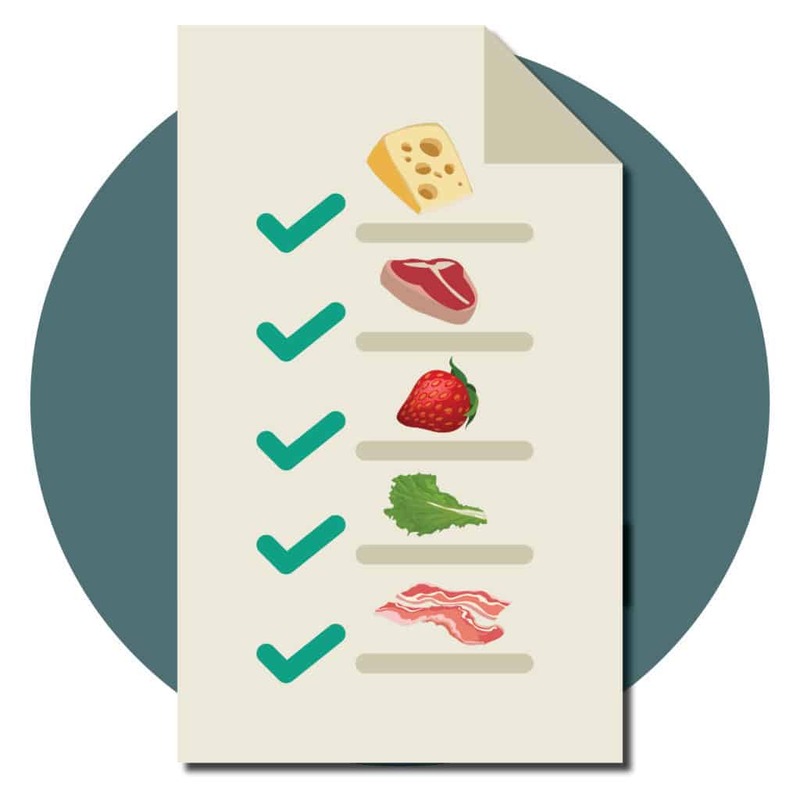 You get to decide how many breakfast/lunch/dinner/dessert/snacks you want in your meal plan. So if you have a work lunch one day, you can reduce your lunches by 1 for the week and platejoy handles it. The last step in customization is the built in pantry! Platejoy keeps track of the foods you have in your house and can tailor recipes to those, as well as deducting them from the shopping lists it generates for you. For me, this is what changes platejoy from “cool meal planning software” to “life automation that saves me hours of time per week”. Here’s how it works. Platejoy takes your meal plan and asks you what items you need to shop for, and what items you already have in your house. Then it sends the needed items to Instacart and you simply have to scroll through everything and make your selection and decide what time you want your groceries to arrive. I would love to see Platejoy start offering a 1 or 2 month subscription at a higher monthly cost. The 6 month plan costs about $10 per month, so maybe a 1 month plan for $15-$18 would be good. I feel like that is more approachable for people and would give people a chance to see for themselves if they like the service before diving into a 6 or 12 month plan. This one is understandable. They have a solid 8-10 keto desserts, but after that it’s a bit sparse. The reason for this is they do not like to use ingredients that cannot be found in most grocery stores, which makes a lot of sense. This puts most keto friendly sweeteners off limits and severely limits what they can do in terms of desserts. I can see this being improved upon as keto/low carb diets become more prominent and keto friendly sweeteners are more widely available. But Are The Meals Tasty? The short answer is…Yes! The first dish we tried was a creamy cilantro chicken skillet and it was phenomenal! The recipes they have are the perfect middle ground in that they are relatively simple, yet they look and taste complex. This dish is the exemplification of that. Next up was the lamb chops with zesty salsa verde. Another dish that you look at and think “that’s going to take me 4 hours to make”, but the instructions make everything so easy. They really have fine-tuned their recipes and seem to have put a lot of testing into them to make sure they are easy to reproduce. This dish also tasted great and was impressive to look at! All in all we haven’t made a single recipe off of platejoy that we haven’t enjoyed. The amount of testing they’re put into their recipes is commendable. I’ve thought long and hard about this question and I can safely say this is a resounding YES! If you’ve spent any time on the internet trying to find good keto meal plans, you’ll know that it’s no easy task. Most of them are going to cost you $10+ and come with promises of weight loss and lengthy testimonials illustrating how that particular plan is single handedly responsible for turning everyone’s life around. And that’s just 1 plan that will last you 14 days! Platejoy offers a dynamic meal plan that you can constantly change to meet your needs, your tastes, or the amount of time you have to cook. They even send the groceries straight to your door if you live in an area where Instacart is available. That is a valuable commodity and I think $10 per month is a fair price for this service. PlateJoy subscriptions come in 6-month ($69) and 12-month ($99) packages, but if you use the promo code: KETOCONNECT you will get $10 off any purchase. This promo code sends a small percentage of your purchase value to us, as well as saves you some moula! We are big fans of Platejoy, as you can probably tell. They fill a niche for those just transitioning to a keto diet that want to start cooking at home more, as well as coming in handy for people with busy jobs that don’t have a lot of time to shop or cook. At KetoConnect our main goal is to help as many people succeed with a ketogenic diet as possible and Platejoy aligns with that goal. If you don’t know how to get started on a ketogenic diet, signing up for platejoy and following their meal plan is a good place to start!